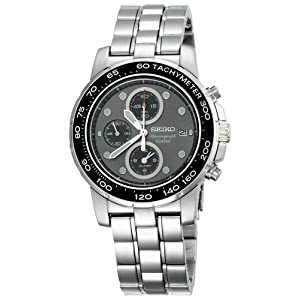 This chronograph features a stainless steel case, bezel and bracelet. It looks less busy than some of the other Seiko chronographs, but still interesting. The black bezel against the silver tones is very eye-catching. It comes with stopwatch and alarm functionality. The date is shown at the 3 position. Its water resistant rating is 100 meters (330 feet). This watch looks great with a suit or in a business casual environment. It's a nice watch and a great gift idea for him.